Home » Why do German leaders have security problems? Why do German leaders have security problems? 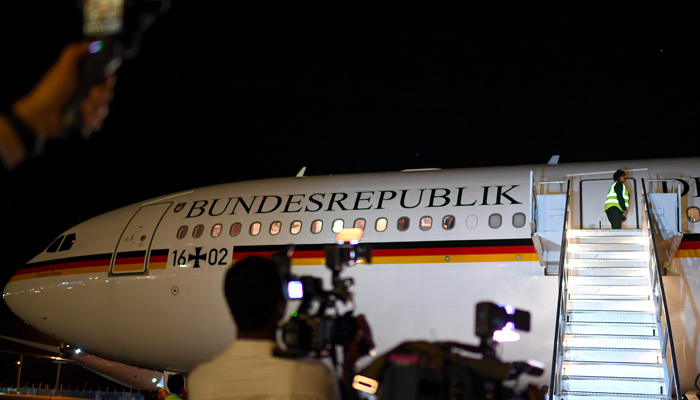 German President Frank-Walter Steinmeier stuck with the German delegation in Ethiopia because of a malfunction of a government plane, Chancellor Angela Merkel for the same reason was late for the last G20 summit in Argentina. What's going on? When the German leaders go on a visit to the country to which they need to fly, everything happens “as if for the last time”: no one knows when they will actually arrive there when they will return and whether they will return from their voyage at all. As they fly on "air coffins". The incidents with their planes happen with such frightening regularity that the worst thoughts come to mind. The last story of this kind happened on January 30 with the President of Germany Frank-Walter Steinmeier, who was stuck with a 55-member government delegation in Ethiopia. What was the reason? Their plane Airbus A340 "Theodore Heuys" broke down. There are problems with the compressed air system. For Steinmeier himself, it all looked like "Groundhog Day." In 2014, as foreign minister, he was also stuck in Addis Ababa due to the inefficiency of the government plane. How much can you tempt fate? In November 2018, a government aircraft of a similar type, Konrad Adenauer, with German Chancellor Angela Merkel on board, interrupted the flight from Berlin to Argentina to the G20 summit and, making a turn over the Netherlands, made an emergency landing at Cologne / Bonn airport because of "Failure of electronic systems". Merkel had to travel to Buenos Aires along with her finance minister Olaf Scholz in the New World by a commercial flight from Madrid, as a result of which they missed the opening of the summit, one of the topics of which was the escalation of the conflict in Donbas and Russia's actions in the Kerch Strait. Both incidents are united not only by the fact that the first persons of the Federal Republic could have died, and not only by the type of airliner, but also by the age of both planes, which are about 20 years old. Before they hit the government's fleet in 2011, both aircraft were intensively exploited by Lufthansa. And until 2011, Chancellor Merkel generally flew on a wreck that could not move without intermediate landings over long distances, which the Government of Germany inherited from the GDR, or rather from the Interflug airline, which had ceased to exist. After the incident with Merkel, the Ministry of Defense, which is in charge of the government's fleet, decided to purchase, for 200-300 million euros, a more reliable long-range aircraft, on which the chancellor and her government colleagues could fly to prestigious international events without threat to life. But it has not yet been bought. However, the problem with the safety of government flights by the depreciation of the fleet is not exhausted. In it there is also a “human factor”, first of all, disorder and carelessness, which were not observed in Germans before. This became apparent when, on January 7 of this year, Gerd Muller, Minister for Economic Cooperation and Development of the Federal Republic of Germany, was forced to make adjustments to the program of his overseas tour of the countries of southern Africa in connection with ... the breakdown of a government liner. A relatively new, in service for about 7 years, the Global 5000 has engine problems. But all this is not trifles, because they concerned the life of the first persons of the country. There are too many examples of German sloppiness. This is perhaps the most blatant of them: since 2006, having already spent more than 8 billion euros, in Berlin - due to the lack of coordination between contractors, technical problems, bureaucracy, environmental concerns and, they say, corruption - the Germans cannot build a new airport worthy of the capital of a large country. The work is expected to be completed by 2023. All these incidents, of course, undermine the international prestige of the country in the world, where the trade slogan “Made in Germany” still sounds proudly, German technology is still considered a model of reliability, and the Germans themselves are considered to be hard-working workaholics, produce products for centuries and do everything Scheduled. However, the current authorities reconcile with the erosion of this image primarily for domestic political reasons. After all, all these stories with airplanes supposedly indicate that they are servants of the people, and save people money on transport, thus personify modesty and unpretentiousness. Unlike the leaders of other countries, who are always scribbling with money and moving around the world on luxury airliners at the expense of the taxpayers. However, the new democratically-sloven image of Germany can only touch the German “greens”. Abroad, no one will be touched by this. Foreigners will laugh. As a result, the image of Germany, preserved from past times, will soon collapse, which is why the German business and millions of Germans will suffer greatly. This problem, of course, lies in the political dimension. Despite the fact that Germany is among the top ten countries in the world for military expenditures and has been increasing them recently, including under pressure from the United States, according to German soldiers, tank crews, pilots and sailors, you cannot say anything about well-being. They need literally everything. Their equipment is mostly outdated and cannot be used. Most of the army galleries are closed due to poor technical condition, there are not enough cartridges. Of course, the country will be able to somehow solve the basic problems of its armed forces in the next 5-10 years. However, no one should hope that time can be reversed and we will again see the “old” Germans — hard workers and excellent soldiers. The Germans are not the same. And there is nothing surprising. "Matriarchy" In Germany: Merkel transferred power to "Merkel 2.0"
Is the Eurozone in a Dead End?